The morning lec-dem sessions hosted by Sri Parthasarathy Swami Sabha figure in the diaries of many rasikas interested in the academics of Carnatic music. They are hosted at 8.30 a.m. every day at Vidya Bharathi Kalyana Mandapam, Bheemasena Garden Street, Mylapore. 8.30 a.m. - Raga Alapana & Abinaya By Dr. A. Sumathi Sundar, Principal, Tamil Isai Kalluri, ( Tamil Isai Sangam), Chennai. This will be followed by a felicitation function to honour Trichy Sri. J. Venkatraman. 8.30 a.m. - Contributions of Veena Kuppiyer By Dr. Rajshri Ramakrishna, Asst. Prof., Dept., of Indian Music, University of Madras. Carnatica hosts a music festival this year at a different venue and titles as Global music fest. The venue is Hare Krishna Movement, No. 63, First Sea Ward road, Valmiki Nagar, Near Marundeeswarar Temple, Thiruvanmiyur, Chennai - 600041. 4.30 p.m. - Inauguration followed by Bhajans - His Holiness. Chitrangini Chaitanya Dasa Swamiji, Hare Krishna Movement, Chennai. Jaya TV & Maximum Media's Margazhi Maha Utsavam is a popular event during the 'season' in Chennai. The series of concerts are thematic and the artistes interact with the audience through a brief Q & A session. The series is held at the Kumara Raja Muthiah Hall in Chettinad Vidyashram school campus, R.A. Puram, Chennai - 28. The concerts are open to all but seats are on first come first serve basis. Popular vocalist T.M. Krishna has chosen to live-stream three of his concerts during the 'season'. The streaming, however is for the rasikas who are not in Chennai. Dec. 23, 2011 at 6.00 p.m. - at Mylapore Fine Arts with the accompaniments of Embar Kannan on the violin, B. Ganapathiraman on the mridangam and Vaikom Gopalakrishnan on the ghatam. Jan. 8, 2012 at 5.00 p.m. - at Kalarasana. with R.K. Shriramkumar on the violin, Trichy Sankaran on the mridangam, B.S. 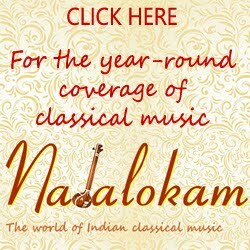 Purushotham on the kanjira and N. Guruprasad on the ghatam. This is a four hour oncert. You need to pay a fee, like buying a ticket for the concert, to listen to these concerts online. These concerts will also be available on-demand for 24 hours from p.m. IST on the following day to accommodate viewers around the world in different time zones. Nandi Fine Arts will conduct its 26th annual music festival from Dec. 2 to 8, 2011. The venue will be the Gokale Sastri Hall, Karpagambal Nagar, Mylapore. Chennai - 4 at 5.30 p.m. daily. The MFAC auditorium is on 45, Musiri Subramaniam Salai, Mylapore, Chennai - 4. Membership Reservation starts on Dec. 4, 2011 (Sunday) at 4.00 p.m. The Madras Music Academy, to repeat ad nauseam, is the "Mecca" of music in the cultural map of South Indian classical music. The Music season actually starts only when the Academy starts, however much other institutions may have started. The Academy being what it is, has a stiff twin objective to meet in providing for the entertainment value without shortchanging the content. Artists are in queue to get a slot to sing and more so in queue to get onto the next senior slot, which actually tells the public about their elevated status. The Academy was one of the earliest,probably one of the first to announce the schedule of concerts for this December season of 2011. The schedule of concerts did reveal the meaning of one old adage : " the old order changeth, yielding place to new" ! The seniors have given place to the juniors, the veterans have given place to the seniors, fathers have given place to sons/ daughters, senior disciples have given place to junior disciples while some have remained untouched . Keeping with the tradition of an inaugural concert by a Sangita Kalanidhi,this time the series begins with Smt.R.Vedavalli. The morning slots, traditionally a veterans' bastion sees the inclusion for the first time of the maestro-veteran Sri.T.N.Seshagopalan. TNS Krishna sings in the evening for the first time this year. Young ladies doing Harikatha have always attracted huge crowds and this year the morning has been handed over to young Suchitra, grand-daughter of the veteran Harikatha artist Kamala Murthy. Neyveli Santhanagopalan sings in the morning and his daughter Sriranjani in the afternoon. Artists like Shertalai Ranganatha Sharma and Manda Sudharani have proved over the years and plodded their way into the evening senior bastion. The shining stars among the young seniors like Gayatri Venkatraghavan, Sikkil Gurucharan, Abhishek Raghuram, Savita Narasimhan have got their due. The senior seniors like Sanjay Subramaniam, Vijay Siva, Unnikrishnan, TM Krishna have their places intact. The "senior ladies quartette", comprising Bombay Jayasree, Nityasree, Sudha Raghunathan andd Aruna Sairam, who continue to attract large crowds and good gate collections have their places intact and remain untouched. Some new juniors have been given a warm welcome to prove thier mettle. all with utmost impartial judgement and clear substantiation. In this the Academy officials as organisers have proved that with ample thought and clear thinking, a well balanced schedule can be drawn which meets up with most requirement parameters on hand. Lets usher in the season of 2011! This year's festival is dedicated to Madurai Mani Iyer whose birth centenary is celebrated this year. university guided by Guru Leelamma. Morning academic sessions are held from 8 a.m. to 10 a.m. Discussions are also open to audience after comments from the Experts Committe members. The Sangita Kalanidhi designate of the year will preside over these sessions. 9.00 a.m. - Ramesh Vinayagam - Notational system for Carnatic music, “Gamaka Box”. 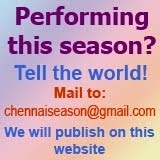 Dance Festival will be held from Jan.1, 2012 to Jan. 21, 2012 followed by Nadaswaram festival from Jan. 22 to 31, 2012.